The business district's dazzling Winter Lights show is back for 2018. The bright lights of Canary Wharf's towers provide quite the spectacle after dark, but the business district glows brighter than usual throughout January thanks to the addition of installations from international artists. 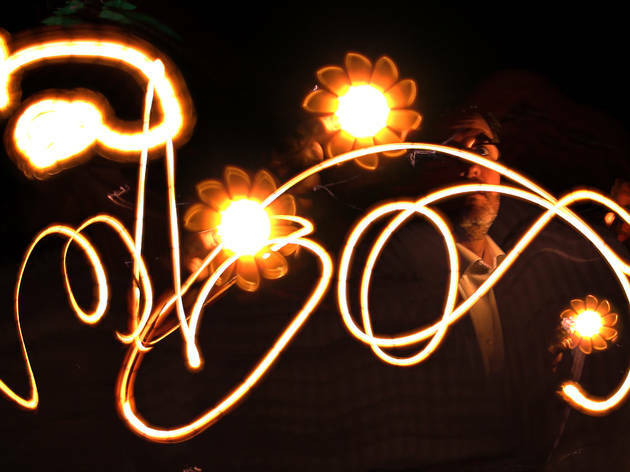 Winter Lights returns in 2019 with a new set of dazzling artworks, installations and interactive experiences. Visit the Winter Lights website for more information and to see the full programme. Canary wharf has changed a bit and there has been more influx of new and interesting restaurants opening up. The Winter Lights festival appears to be an annual event and with the installations scattered around Canary Wharf area, it can be a good way to discover and make your way round this maze of concrete mass buildings frequently populated by busy professionals in this finance district. They range in wow factor, it can be a little confusing to find out exactly where they all are located despite downloading a map from their website. Perhaps it might be better if directions were highlighted or displayed better maybe? Nevertheless, it’s free and worth a look especially if you happen to be in the area. The interactive element is especially clever. Also great to get some interesting photos. I can't believe the other reviews! This event was 100x more successful for me than the much hyped overcrowded and underwhelming lumiere festival. Winter Lights is a beautiful, engaging show of internationally known artists, properly curated and an absolute delight to visit. Not only is it visually stunning, the stream illuminated words created from droplets of water, 1000s of delicate copper wire filaments transmitting light, icicle-like structures rising up from water... but it was really interactive too. We changed the colour patterns of installations via our phones, waved our arms around to create sounds and visual effects, and leapt about on a playground of light-up circular landing pads that responded to our movements and encouraged us to chase the light. Canary Wharf is an intimidating space, but through this festival I've never felt more welcome there. Seriously why write a bad review if you saw it in daylight, or didn't find the installations? This is a brilliant display of creativity and a fun thing to do in gloomy January. This is a clever display - encouraging you to explore the whole of Canary Wharf. It was fantastic. A great one for the Instagrammers. Some were repeated from last year, others like the lit up bench are actually there all the time. But there were loads of gems to admire. The angel one was very popular. Definitely check it out next year. It's fun and free. 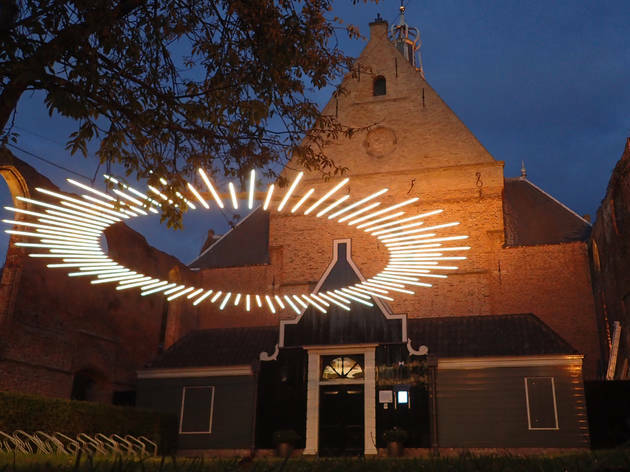 Hands down an amazing light installation festival not to be missed. It was my second time visiting and I loved every bit of it. I managed to see all the installations in one go which was good but I'd say you need to be prepared for a lot of walking, a bit of cold and queues at certain areas (especially the indoor ones). 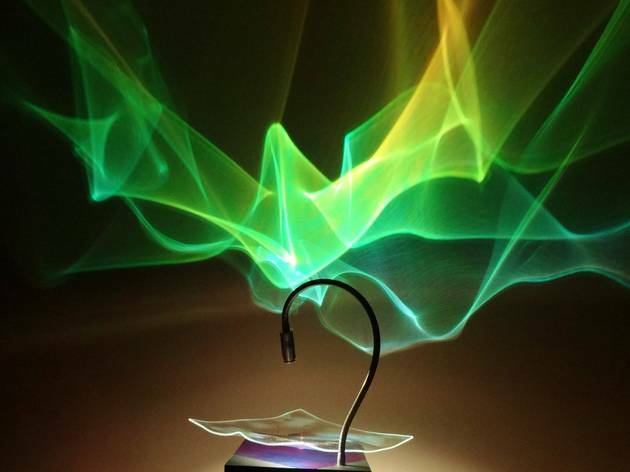 Really interesting and fun light exhibition, with a mix of interactive and stand alone works. I went on Wednesday so queuing time wasn't that long for some, but might be a longer wait on the weekend. My favourite was probably the word waterfall that is connected to The Times' live feed, that spurts out different words made from water droplets only lasting a few seconds, very impressive! I was a bit disappointed that some of the exhibits had been deflated, such as the light bunnies and the giant orb outside the station, but this could have been due to the weather. Canary Wharf is a confusing place if you don't know it well, I had a map but I would have appreciated more signs around to help us find where the exhibits were. Winter Lights Festival is an annual exhibition of lights and colours installations which takes place in Canary Wharf. 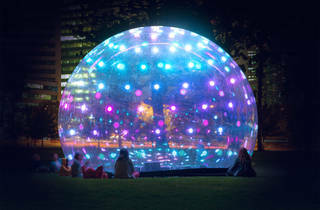 This year there are almost 30 installations made by artists coming from all around the world, Some of my favorite ones are the Sonic Bubble (Australian) which is an interactive plastic bubble that has a multitude of sensors on it, and thanks to people's interaction with it changes colours and emits sounds; and the Reflecting Holons (Netherlands) which are long strips of transparent foil combined with spinning motors, which create a beautiful visual effect. If after work you fancy a walk in Canary Wharf then Winter Lights is something you cannot miss.These work of art are all around Canary Wharf, from the station to the cross rail passage and don't worry if you get lost, there are plenty of ushers that can point you in the right direction or you can simply download a map on the festival's website. The Canary Wharf Winter Lights Festival wasn't quite the London Lumiere Festival, but it was definitely enjoyable and great to see. 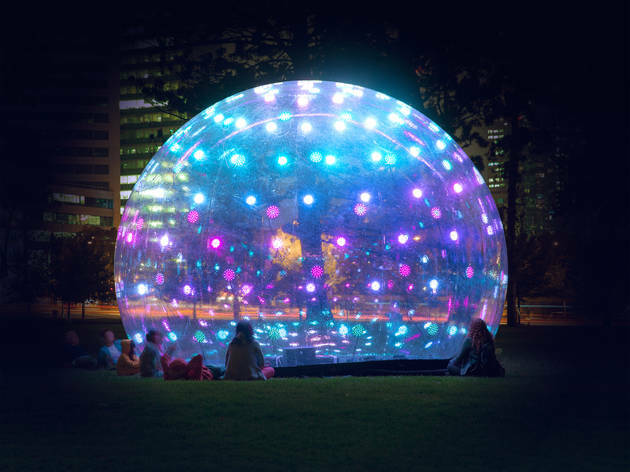 The 30 spectacular light installations were scattered over the business district of Canary Wharf, they are easily accessible and placed not too far from each other. I'm almost immediately a fan of any light show/installation and it was no different for the light installations, sculptures & interactive light shows at the Winter Festival. The lights seemed to soften and add some colour to the stark white lit Canary Wharf. A great way to spend a chilly evening! Some of the highlights for me were the wooden egg structure floating on the water, Bloom, and The Passage. Canary Wharf doesn’t have much going on. I mean it’s a big financial/business hub people commute to but not really a place where you hang out. Well, this initiative is definitely working to change that. 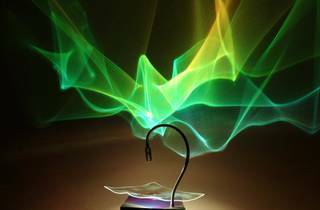 Winter Lights is a great display of light installations, scattered throughout the area. The pieces are all very different, some eerie, some magical, some techy and some plain weird. There’s even a few interactive works, quite interesting to engage with. I highly recommend you give it a shot! Only downside is that it’s quite difficult to find the pieces – even when you download the map. Thankfully numerous staff is on hand to help. I thoroughly enjoyed myself at the Winter Lights Festival a few days back. It's the last night tonight, but if you can, try to catch them before they're gone! 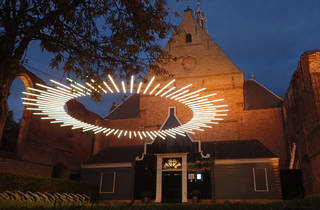 Light has become an increasingly common art medium in recent years, and countless exhibitions each year now love focusing on lighting up the city in new and exciting ways. The Winter Lights festival is no different, and somewhat interestingly takes place in one of the most culturally deceased parts of London - Canary Wharf, land of bankers, wankers and 24/7 offices, and a bit of a walk to Billingsgate Market. What I found most important about the Winter Lights Festival was that it opened my eyes to the beauty of Canary Wharf. It's not just a place where businessmen go, there are some genuinely gorgeous parts to walk through and appreciate. We discovered a rooftop garden, a few bustling shopping centres, a lovely walk parallel to a body of water and more. Exhibitions that take place outside of a traditional gallery force you into changing your perspective and almost looking at art in context, and that in itself is beautiful. Even outside of these 'hidden gems', just walking around Canary Wharf at night made me appreciate the urban beauty of feeling dwarfed by the towering buildings or the grand lobbies of offices as we navigated around the district. If you visit tonight and don't have much time, do spare at least an hour for the section at Crossrail Place, which can be a little difficult to find if you're not familiar with the place. Over at the basement, there are about 10 exhibits, which is more than satisfying for your lights journey. 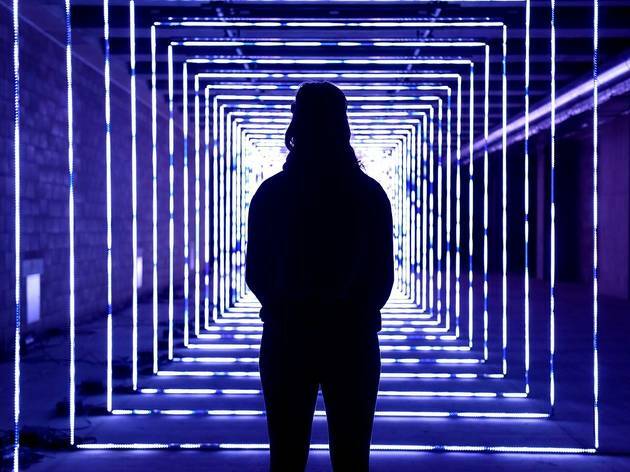 These are mostly interactive, futuristic exhibits that really show you how to have fun with light, from being able to digitally 'paint' people with light, or doing a scan of your body and manifesting it in snow-like pixels (great for instagram of course). My favourite exhibit has to be Shiro by Studio Nonotak, a light show set to electronic, ambient music that was played across walls in the shape of an X, making the light appear three dimensional and like seeing a music video in real life. I hope London continues to have festivals like this! Similar to last year's Lumiere Festival, I definitely had a newfound appreciation for a place I never thought to visit casually. Just remember to dress warm because brrr January is FREEZING. One of the reasons I absolutely love London is for things like this. Just when everyone's pockets are feeling at their most empty post Christmas and pre-payday, London gives you this wonderful free light exhibition to get you out and about and brighten your spirits on a cold winter evening. And it's free!! I haven't spent much time in Canary Wharf so this is a brilliant way to explore the area whilst also seeing some really artistic light displays. There are plenty of maps around which tell you the places to go and if you're interested, each display has more detailed information about the artist and what the lights represent. There's also some really impressive interactive displays which are great for kids. If you're at all worried about the cold or rain there are a lot of indoor displays as well but the queues were getting quite big when I went. Some of the displays did get slightly monotonous but overall if you're looking for something free to do of an evening I'd totally recommend this. Also, if you check the website, you can find some very good offers for dinner in one of the local restaurants. The perfect plan for a date or a night out with friends, despite the cold! And you could complete it with an amazing ice skating session at the most beautiful ice rink in London - Luminocity! 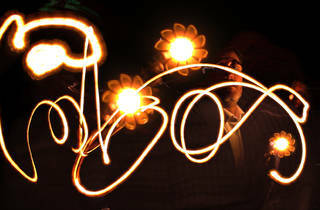 Had a lovely evening at the Winter Lights Festival on Friday. 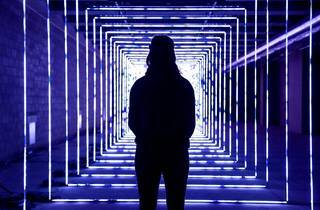 It's a great way to explore Canary Wharf and discover impressive light installations created by artists from around the world. In a small perimeter, you can admire 30 interactive and visual artworks which are amazingly integrated to the urban landscape. My favourite ones were the 'Angels of Freedom' representing a series of five color changing angel wings, the 'OVO' a wooden egg shape structure mixing sounds and lights effects, and the projection of shapes and colors on 'The Water Wall'. So pity it's finishing quite early (9ish pm) as we had to rush to see the last artworks. Definitely worth visiting as it's a nice way to break January's bleakness and it's completely free! I really liked the festival. This is obviously not the same level as what we saw last year in central London during the London Lumieres, but this is lovely. It was just a bit hard to enjoy in the evening, as it was so so cold outside! My hands are still all red because of the cold. Not all the installations are interesting to see, but there is a few really good ones. I really enjoyed the inside ones, at level -3. A bit disappointed that it is closing at 9pm, I had to rush after work to get there at 7, and did not mange to see all of it. You will probably need 3 hours to get around all the installations. This is ending on the 27th so be quick! As if the bright lights of Canary Wharf wasn’t already an incredible spectacle, along comes one the best free events of this able to happen in London to illuminate Canary Wharf even further. It’s simply incredible and you must it. 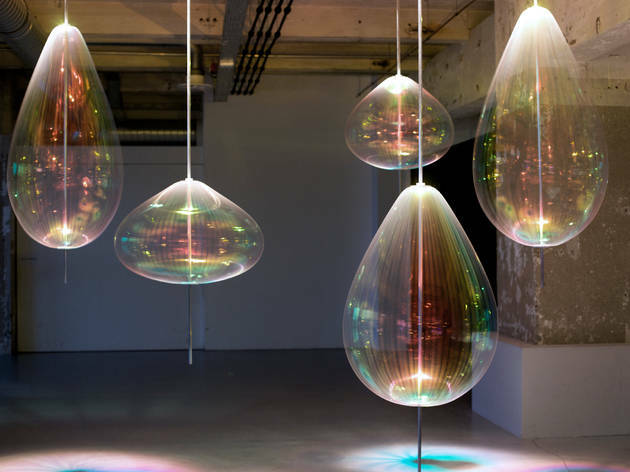 There are 30 mesmerising artworks to see, all located around the impressive estate of Canary Wharf. Some of which are indoors inside the soon-to-be-completed Crossrail station and some are outdoors. As all the artwork is scattered around, It’s a bit of trek to each artwork but it’s well worth it. Just think of all the Instagram likes! It can be a bit tricky to find them all too but it’s rewarding. Think of it a bit like Pokemon GO! But you really can catch'em all. My favourite artwork is Ova, a giant egg located in Montgomery Square on the other side from Reuters Piazza. 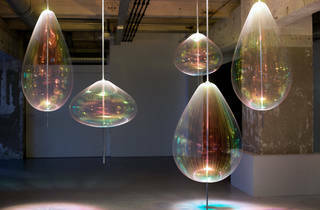 Its ever-changing colours give off an ethereal glow, it appears to be floating on water and the sound surrounding Ova provides an other-worldly experience. It’s completely free, appeals to the whole family and very easy to reach via the tube. Wrap up warm, it will be cold that late in the evening and the best time to visit is when night falls when you can see the artwork at their hypnotic best. Seriously, go! I cant believe all the poor reviews on here - I had a brilliant eve yesterday investigating one of my least areas of London (Canary Wharf) Dont let it put you off that its located in Canary Wharf!! I thought the selection of pieces was fantastic with over 30 pieces - the best ones are in the basement of the new Cross Rail station. There is a real diverse selection of art installations some outside and some inside. Some of them you have to queue but make sure you visit the "On your Wavelength" which uses a member of the audiences brain waves to create a beautiful tunnel of lights controlled by the audience members readings from her brain! Disappointing after last year. These installations are unmemorable and uninspiring, and the descriptions of the artists' intentions are almost comically misaligned with the actual effect the works produce. A real disappointment from last year, the installations weren't as magnificent. It's great for a free festival, but if you don't know the area, it can be hard to find all the lights. It wasn't too crowded and the rain did not deter people. I hope next years is better. The most impressive is the water and light waterfall combo. Very impressive. I definitely recommend this free festival. Is amazing view that keeps you in awesome feeling .... that matches the style of canary wharf _ worlds one of the best place to be ..
Perhaps they look good at night when viewed from a certain angle, but at other times, although it sounds like a great idea in principle, they seem to lack that finishing touch that would have made them aesthetically pleasing to the eye. When you look down at them in daylight and see bare metal poles that haven't been cut to size and just joined together with bolts, they look more like a bit of scaffolding that's fallen off a disused building site.